Adelphi Athletic Director, Danny McCabe, cited the policy adopted by the sports team regarding ‘warm-up’ music as having been followed explicitly. The policy directs that warm-up music must not contain “vulgarity or inappropriate subject matter.” McCabe apparently did not consider the aggressive promotion of xenophobic and military themes to be either vulgar or inappropriate, leading him to conclude that the school was “obliged” to put on the political display. 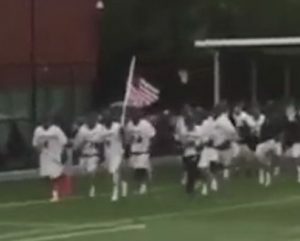 Although McCabe and Adelphi’s administration were unable to discern the inappropriateness of the lacrosse team’s nationalistic demonstration, the NCAA, which sponsors college level post season lacrosse tournament games, demands that host teams must play only “neutral music”. 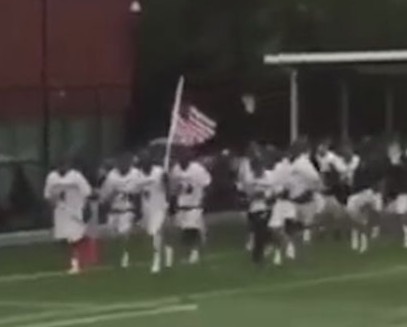 Adelphi spokespersons stated that the Trump-speech music will not be played as Adelphi’s team takes the field during the post season tournament given the association’s rules. Adelphi’s lacrosse team is Division II’s top seed this year with a record of 14-3. It is not clear, however, where the school ranks in teaching its students of the rise of fascist movements in modern history, how public events have in the past been appropriated by fascists for the furtherance of inculcating nationalistic bigotry in populations or how the school fares in conveying to its students how to discern what is appropriate behavior and why it is important to consider the consequences of their actions. theme reimagined by barnyard tree.